I’ve been bingeing on all things British lately, so I was predisposed to like this tale. Plus, it appears to be about evil spirits to boot. I think…but I’m not sure. But that’s not the only issue. I also can’t tell what mood and tone the writer is going for here. And that, dear friends, is our dilemma, and lesson for the day. By the time she got home, Marte’s hands and feet ached with the cold, and her empty stomach was nauseated by the stink of the wharf. Her backpack clinked as she climbed the front steps. She’d found a few useful bits. Abalone shells, sea urchin spines, driftwood—the sort of trinkets the Life and Death folk could make use of but couldn’t get close enough to the water to gather for themselves. In the early evening light, the ghostly chalk tracings of hexafoils—that surrounded the door frame and continued in paint across the threshold—seemed almost to glow. A comforting sign of protection. Turning her key in the lock, Marte leaned forward, set her shoulder to the swollen door and gave it a sharp bump. It squeaked inward slightly, showing only a crack of the familiar floorboards beyond. The damp Autumn nights were taking a toll on all the old houses. Off balance, Marte stumbled to the floorboards, swearing at the unexpected bolt of pain that ran up through her left knee and into her hip. Reaching up, she grasped the door handle to pull herself to her feet, trying her best to get a grip on the situation. Her baby sister, Eve, was a squalling bundle in their mother’s arms, face red and rigid, as if about to implode, while their mum, Irena, was just as flushed, her usually pale skin mottled an ugly vermillion and white. Dressed to go out in the cold, she wore her pea-coloured coat, but both her temperature and mood were clearly on the rise. Irena’s fingers were gripped into tense claws behind Eve’s shoulders and she jiggled the baby painfully up and down, as though that might quieten the infant bleat somehow. Treating herself to a deep breath and squaring off, Marte readied herself for the onslaught. “What’s going on?” she asked. “I’m going to be late. Again!” Irena practically stamped her foot as she spoke. As we’ve often noted with our First Pagers, it’s hard to get your bearings as a reader in a mere 400 words. We lack the clues of cover art and back copy to ground us, so we critiquers often have to guess where we are, what year it is, and what genre we’re reading. All this said, you can still wrangle in readers with a well-written tease, even lacking context. So what do we have here? Where are we? What era is it? I’m not sure. I’m guessing it’s England (“You’re bloody late!”), somewhere near the sea (Marte has gathered shells). What year is it? We get an enticing clue — hexafoils on the door. If you don’t know the term hexafoil, you’re not alone. I suspected it was an old marking of some kind but I had to look it up. 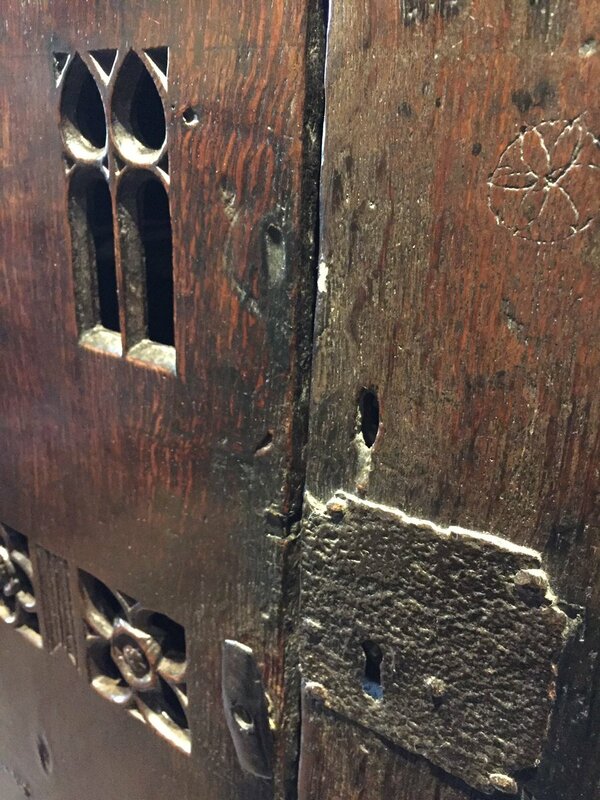 Hexafoils are designs that appear in religious art and architecture (ie stained glass windows) but they are also medieval graffiti found in barns, churches, rural buildings, scratched in wood or stone to ward off evil spirits. Way cool! I’m in. Love reading about darkly lit corners of British folklore. I’m an Anglophile, especially if it’s the old stuff. (Just got done watching Elizabeth and Lion in Winter again and am currently reading Minette Walter’s doorstop of a novel about the black plague, The Last Hours. Problem is, with this submission are we in medieval England or present time? I can’t tell. The house is old, the door warped, but there is nothing else to tell us if this is 1769 or 2019. The proper names are vaguely old-fashioned sounding. Hexafoils (also called daisy wheels) are ancient but can still be seen everywhere in the England countryside. Marte is carrying a “backpack,” which is a modern word of American derivation. (as opposed to rucksack or knapsack). And when confronted by angry mother, she says, “Okaaaay,” which sounds like a petulant modern teen. So…we have confusion here, right off the bat. Which is a shame, because, like I said, I want to like this based on the small clues dropped about the daisy wheels and the mysterious Life and Death folk. I wanted to know more about them and why Marte was collecting trinkets for them. But where does Marte go? Home — which needs a bit more description so we can tell where we are in time and space — and straight in the arms of a rather boring domestic scene. Yes, there is tension created when Mom begins to rag on Marte, but given the fact that Marte’s character is still a mere sketch so far, I didn’t care. My only emotion was to want to go back out that door as fast as possible. I’m a bit at sea with this submission, because I am not sure what would make it stronger. And because there is some confusion about era and geography, I’m finding it hard to advise about a better way to begin this story. I can’t figure out what kind of person Marte is (even her age range) and why we, as readers, are being asked to enter her life at this particular point. Especially since the clues about evil spirits and Life and Death folk are far more interesting than a crabby mom and squalling baby. Maybe the writer is trying to show us Marte’s “before” life so when something does happen to her — the “after” — we will be intrigued and care about her journey. But that, as James often points out, is a fatal mistake of many opening pages. Don’t show us the normal life and then up-end it. Get to the conflict and then you can go back and explain what happened. 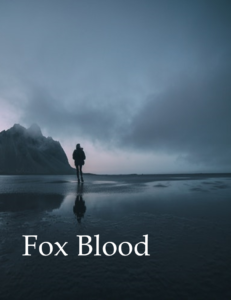 Fox Blood and Family Anchors Not crazy about this title. If you’re writing about medieval ancient spirits in old or new England, you can do better. By the time she got home, Marte’s hands and feet ached with the cold, and her empty stomach was nauseated by the stink of the wharf. So, does she live right by the wharf? Be more specific about where we are. Her backpack clinked as she climbed the front steps of her house. She’d found a few useful bits. Abalone shells, sea urchin spines, driftwood—the sort of trinkets the Life and Death folk could make use of but couldn’t get close enough to the water to gather for themselves.This, to my ear, is the most intriguing phrase in your opening. So somewhere there is a coven of weird folks who do magic with talismans from the sea but they can’t get near the water! In the early evening light, the ghostly chalk tracings of hexafoils—that surrounded the door frame and continued in paint across the threshold—seemed almost to glow. Another nice image, but a tad confusing. If they are chalk, that means they were put there recently since they would be erased in rain. So these are NEW daisy wheels? Who put them there? Did she do it? Why not tell us? A comforting sign of protection. Turning her key in the lock, Marte leaned forward, set her shoulder to the swollen door and gave it a sharp bump. It squeaked inward slightly, showing only a crack of the familiar floorboards beyond. The damp Autumn nights were taking a toll on all the old houses in where? Here is where you can slip it in. Off balance, Marte stumbled to the floorboards, swearing at the unexpected bolt of pain that ran up through her left knee and into her hip. Reaching up, she grasped the door handle to pull herself to her feet, trying her best to get a grip on the situation. Again, too much with the door. And what does “trying her best to get a grip on the situation” mean? She doesn’t even know what the situation is yet. Unless you had hinted before now that she KNEW she was late, that she had purposely lingered on the beach, not wanting to go home to this hell. As I said, you gave us so little about Marte before this, that it’s hard to care. Her baby sister, Eve, was a squalling bundle in their mother’s arms, face red and rigid, as if about to implode, while their mum, Irena, was just as flushed, her usually pale skin mottled an ugly vermillion and white. Mottled means marked with color, so you’ve double-stated the flushed/white/pale thing. Her pale face mottled with red spots. Dressed to go out in the cold, she wore her pea-coloured coat, but both her temperature and mood were clearly on the rise. Irena’s fingers were gripped into tense claws behind Eve’s shoulders not sure what you mean here. Isn’t she holding the baby? and she jiggled the baby painfully only the baby can feel the pain and you’re not in her POV. up and down, as though that might quieten the infant bleat somehow. The way you phrased this sentence sounds very old-fashioned, which is fine — if we are deep in the past. Treating herself to a deep breath Treating herself? She just pulls in a deep breath. and squaring off, Marte readied herself for the onslaught. Don’t overstate. If she pulled in a deep breath, that implies she is readying herself for something. Say it once and trust the reader to get it. “What’s going on?” she asked. “I’m going to be late. Again!” Irena practically stamped her foot she either does or does not. as she spoke. Again, I really liked the opening image of this person coming back from the beach bearing these things for the mysterious Life and Death folks. I’m almost thinking you came into your scene too late and I might even want to meet Marte on that lonely cold beach searching for her odd treasures. We might think she is a normal shell seeker but then you can start dropping hints as she thinks — is this bit of abalone the thing that will save me? Will this sea urchin spine set me free? I think you might need to slow down and do a bit of world building here before you take her into mom-hell. Consider, for a second, how much more compelling the beach scene could be — green roiling waves, cold wind, the sickly white sun sinking in the sea. Marte is hurrying to finish her chore of finding things for the weird people before dark. Because evil things happen in the dark. What is her mood? Is she scared of something? Is she depressed about going home? Yes, she can be thinking, but may be she sees someone strange watching her on a cliff? Or you can stage a scene on the beach with a stranger, so you get some dialogue. It might give you a chance to tell us something about the Life and Death people. You can imply danger, begin foreboding, and mirror Marte’s thoughts by using your unique location. Instead of opening in a claustrophobic house amid a petty domestic scene (small canvas) maybe you need the outdoor backdrop (big canvas) to humanize your character and make us worry about what is going to happen to her. Does she have to take these weird trinkets to the Life and Death people? What is she thinking about THAT? You need to inject an element of mystery. Set us in time and place. Chapter 2, you take her home…maybe. Because I don’t think your main story conflict is about mother-and-daughter. I hope it is something larger and more compelling. Ask yourself: What does Marte want? Peace with mom? No, that’s too small, so why open with it? What does Marte want in the deepest part of her soul? That is your story. That is what you have to hint about (the conflict) in the opening. Thanks writer, for letting me visit England again. Just make it — and Marte — come alive more! Thanks for looking up “hexafoil,” Kris. I didn’t know the term either. “Tense claws” grabbed me. A mother holding her baby in that way hinted at serious abuse. Maybe the evil spirit is *inside* Marte’s house, not outside. What is Marte’s age? With an infant sister, she’s probably quite young. Give the reader an indication. As always, Kris, your line edits are spot on. Brave Author, thanks for giving us a look at your first page. It sounds like a contemporary, YA, dark fantasy to me. I’m intrigued. I like (love!) the way you used sight, sound, feel, and smell in your opening. PJ gave you an excellent critique, and I agree with her about Marte’s character. Marte is interesting, but we don’t have enough to care about her yet. For me it would work if you spent less time on the door and mom and used that precious first page real estate to give us more of Marte’s desires/goals. The opening may not be perfect yet, but it piques my interest. I would turn the page for more. Best of luck on your continued writing journey, Brave Author! I agree, Priscilla…intriguing and there’s a YA feel to it, which is why I wish we had an indication of Marte’s age. For some reason, at first I pictured an older woman but then we got to the sister-baby and I realized I was reading a young person. But we also need more grounding in what era we’re in. Take a close look at Kris’ notes. I looked up hexafoils. Good thing I was reading online and not on paper. I thought you made the word up. And yes, either carve them into the wall or paint them. Loose the chalk unless putting new ones up all the time is important. You did spend a lot of time on the door. And there are some extra words about the flooring that just don’t do anything to further me along the story. Pea colored? I am assuming you mean something in the green family. New pea green, garden fresh green pea, canned green pea green gray, or did you mean Pea coat navy blue? Overall I think you have something I would want to read. Great start. Ditto your thoughts Alan. I misread the coat as a pea-coat as well! And yes, I would read on, given some fleshing out of Marte. Ooh, I love your idea of opening on the beach, Kris. Fantastic advice in this critique. The most intriguing part of this, for me, was the clan on the beach who can’t go near the water. Anon, you need to give us a reason to flip the page by raising story questions. Intrigue us. Tease us. Save the stuff about mom for later. Best of luck! That was my thought, Sue, that the folk people are a really successful tease. I can’t wait to learn more about them and what relationship Marte has with them. The smaller drama with mom can come later after we are more invested in the story, maybe. Brave Author, PJ’s advice to start on the beach is solid. While Marte is picking up her last shells weave in some information about the Life and Death folk. Why can’t they find their own sea bits? Is it illegal to gather shells and driftwood for them? Does she have to sneak around to do this? Continue your worldbuilding by giving us a glimpse of the neighborhood or village as she approaches her house. You’ve told us the houses are old. Are they big? Dilapidated? Are there widely spaced gardens surrounding the houses? Is the neighborhood close to the sea where she scavenges for the clan? Is her house the worst in the neighborhood or the best? What do the people she passes on the way home wear? What’s their attitude? Don’t overwrite it, but let us see something about where she is and what’s around her. And maybe most important to this chapter, give us at least a teaser about why she can gather the shells while the Life and Death clan can’t get close to the water. What’s the tension point for this chapter? It can’t just be that she’s late getting home. We’ll flip the page if there’s some conflict happening, but probably not for a family disagreement before we know Marte. You’ve an enticing start here. Happy writing, Brave Author. Good points all, Suzanne. Esp your point about “what is the tension point for this chapter?” I stress often here that picking the right moment to open your story is maybe the single most important decision the writer makes. Our submitting writer here might want to consider a more enticing attention-grabbing entry point. My idea about the beach is just one…but it seems all of us here want to know more about the Life and Death folks! So there is great material here. Thanks for sharing your work with us, brave writer, and thanks to Kris for her wise commentary, as usual. Some of what I have to say may sound similar, but it often helps writers to hear similar comments from multiple sources. 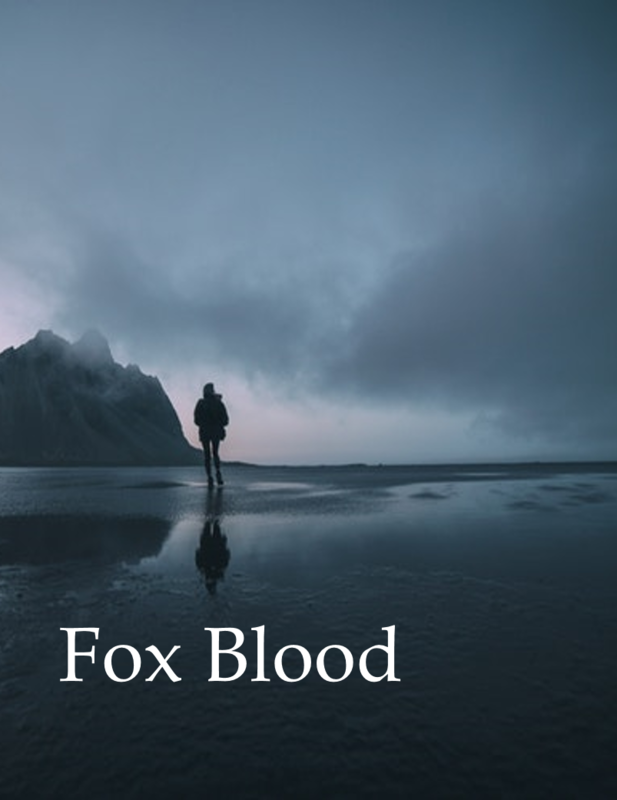 Fox Blood and Family Anchors is a mouthful. Would just Fox Blood work? Marte’s hand and feet ached from the cold, and her stomach churned from the stink of the wharf. Simple. Immediate. Avoid “was something by something” constructions (“was nauseated by”). This is another example of overwriting. Too much ado over a crying baby. First page real estate is precious. Use it wisely. I understand that you’re trying to paint a picture for the reader of your story world. However, I think you can condense the writing without losing any of the meaning. Good writers often try too hard on the first page! Don’t over-describe the character’s actions. 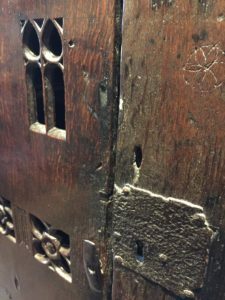 When you describe every detail about a character opening a door, the reader is primed for something spectacular to happen once the door is opened. Who are the Life and Death Folk? more was mentioned. If this detail isn’t important to the conflict in the first scene, save it for later. Everything that happens on the first page should be very deliberate. This sentence is a perfect example of telling. Show the reader Irene’s temper by her actions. Irene slammed a plate onto the table. Because of such-and-such, the character did such-and-such. Watch out for clauses in sentences that attempt to explain a character’s actions. Don’t tellthe reader Marte was off balance. Just show the reader that Marte stumbled. Don’t tellthe reader about the unexpected bolt of pain. Only show Marte’s actions. No need to capitalize the A in autumn. I believe Kris already mentioned the problem with the semicolon. Be sure to use an editor to correct these kinds of things. There are many schools of thought about adverbs. Do you need all of these adverbs on one page (forward, slightly, only, usually, clearly, painfully, barely, practically)? You’ve dreamed up a very interesting story world. I’d like to see your first scene have more forward momentum. Think goal, motivation, conflict. Best of luck, and keep writing. Good points as usual Joanne. Thanks. Thank you so much PJ, and all who commented, for your fantastic advice!! As picked by Priscilla, the work is a contemporary, YA dark fantasy. The story is set in a what was once a british colonial outpost. Debbie, you are right, there is an evil presence inside Marte’s house – her father is one of the Life and Death folk. I guess that is partly what motivated me to start in the domestic setting but, clearly, I need to rework that idea for the good of the whole! The landscape is also a dominant figure in the story – so starting on the beach makes a lot of sense and will certainly help to set the ‘colour’ of the narrative and ground the reader. Great idea! I’ll have to work on fleshing out Marte and strengthening her pov. It really is amazing how a little fresh perspective can pinpoint the problems that have been staring me in the face for so long! Thanks for speaking up, writer. I wish more of our writers would so we get a sense if our comments are helpful. If your landscape is central to your mood/plot, then by all means you should exploit it! Take us there as you see it in your head and make us see and feel it as you filter it through Marte’s consciousness. Make the location a “character” in itself so it can amplify, complement and “comment” on Marte and her journey. And the father angle is pure gold! But that can be introduced later and will be a great way to amp up the plot and tension as you go deeper into the story. Keep going!